Breyinn Loftin, a second-year Ph.D. student in the Department of Chemistry, is the recipient of an NSF Graduate Research Fellowship. Widely considered to be one of the top honors a graduate student can receive, this fellowship is highly selective, with over 12,000 applicants this year for 2,000 awards. 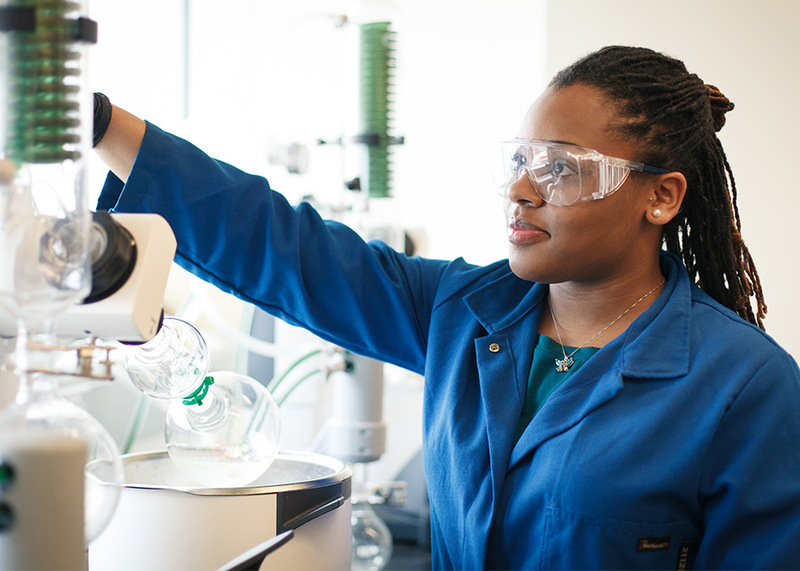 Breyinn Loftin, a Ph.D. student in chemistry, synthesizes and characterizes polymers for use in biomedical applications. “I am truly grateful and honored for this award,” said Loftin, who is advised by Eva Harth, professor of chemistry and director of the Welch Center for Excellence in Polymer Chemistry. This fellowship, which runs for three years, comes with a competitive stipend, an allowance for tuition, as well as additional professional development opportunities. Loftin, who got involved in research as an undergraduate, works on the synthesis and characterization of polymers for use in biomedical applications. “Polymer chemistry is very applications-based,” said Loftin, who cites that as one of the reasons she entered the field. “My research focuses on 3D-polymer networks, also called hydrogels, which can be used in regenerative medicine applications,” Loftin said. Regenerative medicine is the science of using living cells to repair or replace diseased or damaged tissues. One potential application for hydrogels would be as a replacement for articular cartilage, which is the type found in joints. When articular cartilage wears away, the result is arthritis. Loftin is working on developing hydrogels and polymerization methods to tune the mechanical strength and elasticity of these gels. One of the major challenges for research in this area is designing materials that are biocompatible while possessing the necessary strength for its biological environment. Loftin’s research focuses on adapting hydrogel properties, fine-tuning their physical and chemical properties, to better mimic the tissues and fibers found in the body. She plans to utilize polymer chemistry concepts and techniques to prepare a variety of polymer materials for her research. She’ll be testing out these polymers to see which ones have potential for use as replacement materials in the body and other biomedical technologies. “A huge part of this research includes finding new ways to join polymers together to create a unique material,” Loftin said. Moving forward, Loftin wants to use her time to mentor others.